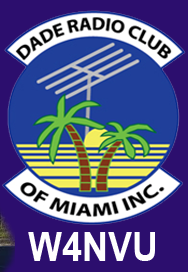 January 2011 Meeting Minutes – W4NVU – Dade Radio Club of Miami Inc.
Meeting was called to order at 19:53 with 33 present. Ernesto presided over the meeting and welcomed everyone and hoped everyone had a great holiday. The meeting was broadcast live on the air tonight from the EOC. Testing is being done in the other room. The microphone was passed around the room and everyone took turns and stated their name and call sign. Ernesto welcomed everyone again. We have a quorum. We do not have a guest speaker tonight. Ernesto reminded everyone present tonight to sign in. Robert spoke about the 220.000. It is at his house looking for a home. It is not on the air. Merritt spoke about the 147.000. It’s working. Carl spoke about the 444.200. It’s working great. It’s loud. It needs a new controller, but will wait until it starts having big problems. Ray spoke about the 146.760. Everything’s working well. We’re on it now. Ernesto could not make the Holiday Dinner/monthly meeting. We had a great turnout. John Hall spoke about it. He said that we can get them to cater if we have a place. Everyone thanked John for the work he did. Thank you John! Robert spoke about the Boy Scout Jamboree that took place on Saturday, December 11 at Joe Robbie Stadium. Robert and Virgil set up the radio equipment, but the biggest draw was the solar panel array. For next year, we should concentrate on emergency preparedness. The group had a discussion on solar panels and places that sell them. Some members spoke about the solar panels that they have. Robert stated that we had the first solar powered repeater until lightning hit it. Merritt spoke about a paging system for Hams to use in an emergency and at events. He is still working on the project. His goal is to have it completed before the MS 150 so that we can use them. Ernesto asked if there was any more old business. There was none. Ben Nemser spoke about the Miami Marathon that is to take place on January 30, 2011 (Sunday). They expect over 20,000 participants. There are going to be school kids that are going to run the last mile of the marathon. This is the Miami Marathon’s 9th year. Ben needs volunteers. If interested, you need to bring your own 2 meter portable radio. The race starts at 7 AM and is over by noon. It starts downtown, goes to Miami Beach, back to Miami, through Coral Gables and Coconut Grove and back to downtown. If interested, contact Ben at Bnemser@nemal.com or at 305-439-7190. His call sign is WA4D2S and he can also be reached on 14.260. Ernesto and Merritt both have participated in the past and said that they had a lot of fun. Sam brought up a discussion of the insurance for the club and if it is current. Sam made a motion to see if the club’s liability insurance has lapsed and if so, to have it reinstated as soon as possible by the appropriate agency or ARRL, seconded by Carl. After a vote was taken, the motion passed. Sam then made another motion that during the coming year to delegate to the president the authority to sanction activities by the club and its members of other non-profit organizations, i.e., Boy Scouts, Miami Marathon, Multiple Sclerosis, Jr. Orange Bowl Parade, Kayak Race, Cystic Fibrosis, March of Dimes and others to participate, seconded by Carl. After a vote was taken, the motion passed. It was also discussed that whoever looks into the insurance, to make sure that our equipment (radios, antennas, etc.) are also covered. It was also discussed to have the Treasurer and Officers bonded. A discussion took place about the types of insurance for the club. It was decided that Ernesto will appoint a Finance Committee to review the club’s insurance to see what needs to be done and if the By-Laws need to be amended. We have funds sitting in a non-interest bearing checking account. It was also discussed that this money should be invested on the club’s behalf. This too will be covered by the Finance Committee. Ernesto said that he will discuss it with several individuals and make the appointments next month. Dave came into the room and announced that we have two new Generals – Michael Dyer and Javier Gonzalez. Congratulations Michael and Javier! Robert Spoke about the equipment that was donated by the Boy Scouts and that there are 2 amplifiers. One needs new tubes that will cost approximately $300.00 each. He also stated that the club needs a radio set-up to take out into the field and to events. John Hall stated that we have equipment all over the place. After the meeting, he is going to meet with Robert. After discussion by the members, Robert made a motion to sell the amplifier with the tubes and turn over the funds to the club, seconded by Miguel. A vote was taken and the motion passed. Sam abstained. Ernesto announced that 2011 dues are due. You can pay your dues tonight or mail them to: Dade Radio Club of Miami, PO Box 452253, Miami, FL 33245. It is $30.00 for membership and an additional $5.00 for each family member. Carl announced that it is time for him to retire in about 3 months. He needs someone to take over, possibly 2 people. If interested, please see Carl. He suggested someone younger to keep the club going. Virgil spoke about putting together J-pole kits and selling them for a reasonable cost. It was suggested that we make them at a meeting one night. Ray announced that to get on South Fla Hams you need to join Yahoo Groups. You go to SouthFlaHams.com and sign up to join. Ernesto asked if there was any other business. With no other business, Ernesto thanked everyone for coming. A Motion to close the meeting was made by Dave, seconded by Caesar. Voted and passed. The DRC meeting was adjourned at 20:53 and the meeting was taken off the air.